Why do calls for diversification of European gas supplies divert attention from the financial interests of energy consumers? When you are struggling to pay growing gas and electricity bills, about whom would you first think? Probably most often you are thinking about a rise in prices and your relationship with energy supply companies. It is unlikely that in this case you are more concerned about the changes in the global energy market and the current development of the global energy policy. Of course, nobody doubts that there is a link between what is happening in these global spheres and the retail price of gas for heating systems in our homes. However, practically such an impact of the processes on a global scale does not look like those, which in our view should be according to the fundamental market laws. Therefore, it is worth seeing the facts and trying to understand how, figuratively speaking, "messages" from the world market and the sphere of energy geopolitics really reach our energy consumers' finances. Such an unprecedented strong "message" is the steep fall of oil prices, which became one of major events in the world development. According to “The IEA Oil Market Report”, oil prices sank to six-year lows in August 2015 as a supply overhang grew and concern deepened over the health of the global economy, especially in China. As before, oil prices were affected by high volatility, and the Brent crude oil traded in September slightly above 48 USD per bbl. and NYMEX WTI at 45.20 USD per bbl. The fall of oil prices carries manifold implications. Low oil prices are said to be the key reason for the financial market instability, outflows from the energy sector and other harmful effects. It is nevertheless obvious that a significant decline in oil prices should bring tangible benefits to end users of energy. In the EU gas market even the "rocket and feather" criticism is not sufficient to describe actual distortion of pricing in gas supply chain from production to end consumers. 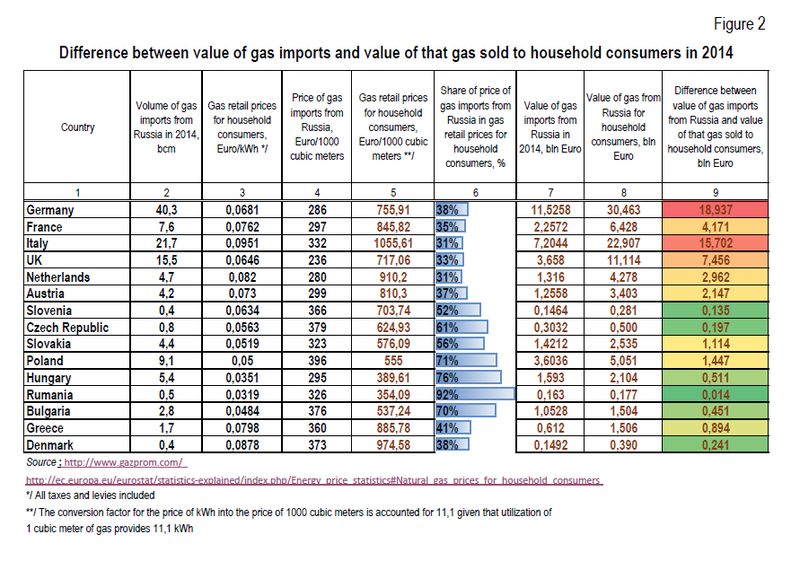 It is well known that gas imports by pipelines strongly prevails in gas supplies in many EU countries. According to "BP Statistical Review of World Energy June 2015", natural gas was imported into Germany in 2014 exclusively by cross-border pipeline amounting to 85.0 bcm. Italy's imports of pipeline gas totaled 46.9 bcm of gas in 2014 and only 4.5 bcm in the form of LNG. A distinctive feature of the pipeline gas trade is that many gas contracts are long-term covering periods up to 20 years. It is particularly important that prices in these contracts have commonly been linked to oil prices. European contracts use mixes of oil products or crude oil and usually include review clauses, specifying that either side can request a review – typically after three years. Linkage of long-term contract gas prices to those of oil is based on price competitiveness of two main kinds of fossil fuels that end-users should have a real choice between burning gas and oil products, and would switch to any of them if given a price incentive to do so. An alternative is hub-based prices that have not been so widely used in Europe yet and they are applicable in general to other types of contracts and in other world regions. There is no doubt that what it is written in the contracts of our European companies and their foreign partners - providers of gas to the EU are strictly observed and as a result due to oil prices decline import prices of natural gas have also moved downward with a certain time lag, usually from 3 to 6 months. Despite these changes "Eurostat" data of the Figure 1 below shows that the decline in oil prices has not had adequately impact on the retail gas prices for domestic consumers in the EU. Brent has shown long dramatic decline since 2012 while the EU-28 average gas prices for domestic consumers continued to grow with some seasonal fluctuations. So what is the reason, you may ask, behind the fact that oil prices has been falling, and contractual prices for gas imports follow the trend with a time lag, but average retail prices for gas in the 28 EU member states do not respond properly? The point is that one of the main reasons for these inconsistencies is reduction of the relative share of gas cost in retail price. So what do citizens of the EU have to pay for? Actually, besides the cost of gas there are another two components in retail price: one is network costs related transmission and distribution infrastructure costs and the other - taxes and levies. In 2014 the European Commission published a working paper "Energy prices and costs in Europe", which analyzed the changes in the structure of gas retail prices for households and industry in the EU for the period from 2008 to 2012. In particular, it is noted that the energy cost element is generally the largest, though its share is diminishing. At the same time on average for the EU the network component for households has risen within only five years by 17% and taxation went up by 12-14%. According to "Quarterly report on European gas markets" (vol.8, issue 1; first quarter of 2015) published by the Directorate-General for Energy within the European Commission, the retail price has the following structure: on average, 50% of the price covers the gas itself, while the other half covers distribution/storage costs (25%), energy taxes (9%) and VAT (16%). However, there are significant differences across Member States. It is not a random choice of gas supplies from Russia. Сommissioner Arias Cañete emphasized at the European Parliament Plenary in Strasbourg on 7 October 2015, that the EU still imports around a third of its gas from Russia. In his opening remarks Commissioner Arias Cañete also said, “We would like to see Russia as a reliable supplier of natural gas in future; but we would also like to see that the transport of Russian gas fits into our diversification strategy”. The question that arises then given the facts presented above what do you think Brussels should remain focused on implementing the EU energy policy in favour of end users of gas and their current well-being? On the one hand, no one denies that the diversification strategy is aimed at protecting the interests of gas consumers in Europe, as it should serve to strengthen the guarantees of security of supply. It should also then be recognized that Russia also is fulfilling, as if in line with the wish of the European Commission, its own strategy of diversification of supply enhancing the existing gas pipeline network to the EU by launching new projects Nord Stream 2 and the Turkish stream. But on the other hand, we may wonder whether it is impossible at the current diversification of supply, which allows our countries to make good money from gas imports, to maintain reasonably justified level of retail prices, consistent with global trends? In other words, geopolitical aspirations initiated by Brussels and their transatlantic allies should not overshadow and override vital financial interests of the Europeans. 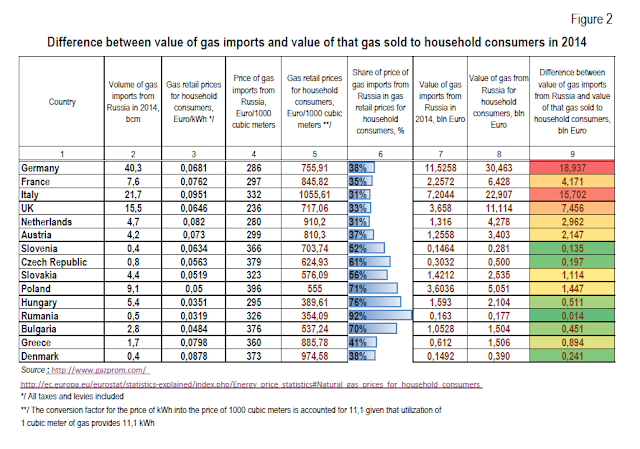 Why is it hard to provide gas consumers with guarantees that the energy policy of the European Commission does not leave aside the issue of an unjustified level of retail prices and does have a positive impact on the financial well-being of EU citizens?